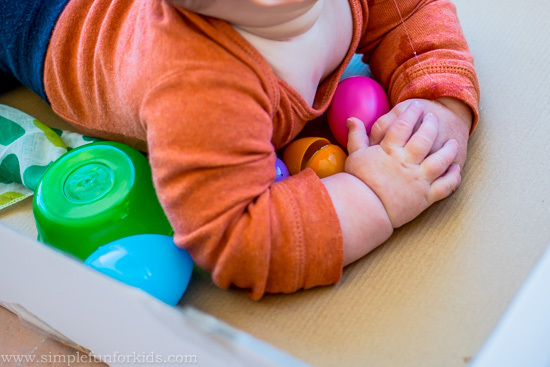 After Baby N had so much fun playing with plastic Easter eggs the other day, I wanted to give him a chance at more sensory Easter fun. 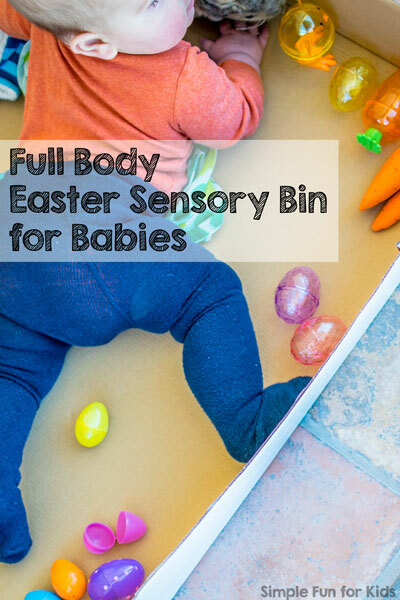 E has played with an Easter sensory bin before but since N can’t sit up yet, I knew a “traditional” sensory bin wouldn’t be right for him. 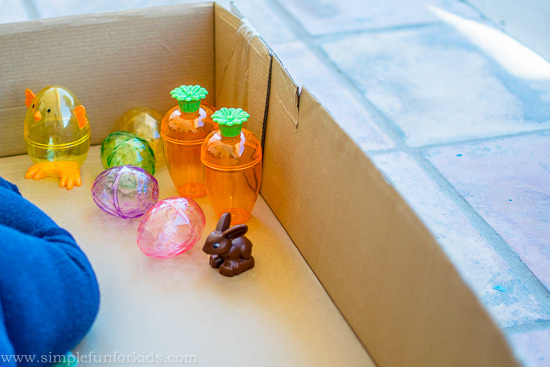 Then I remembered the huge box we had in the garage – and made him a Full Body Easter Sensory Bin! Large box top with low sides. Assorted baby-safe bunnies, chicks, carrots, etc. 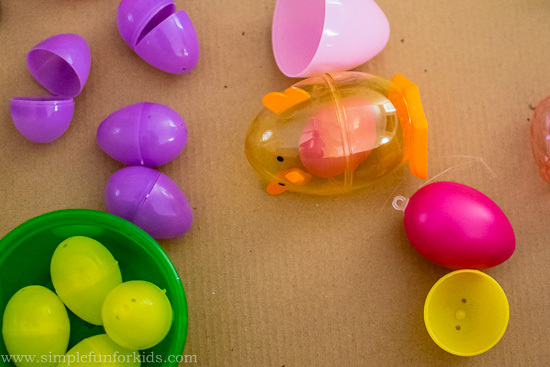 I went into preparing this activity thinking that we didn’t really have much baby-safe Easter stuff except for the plastic eggs. 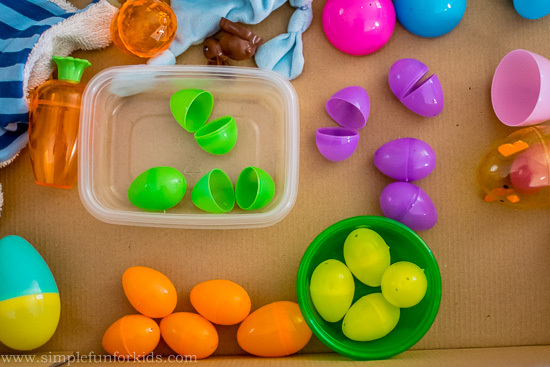 I ended up pulling together a large variety of plastic eggs, a few stuffed bunnies, carrots from E’s grocery store, a LEGO Duplo bunny, some random bowls, and added a soft scarf just because N had enjoyed cuddling up to it before. 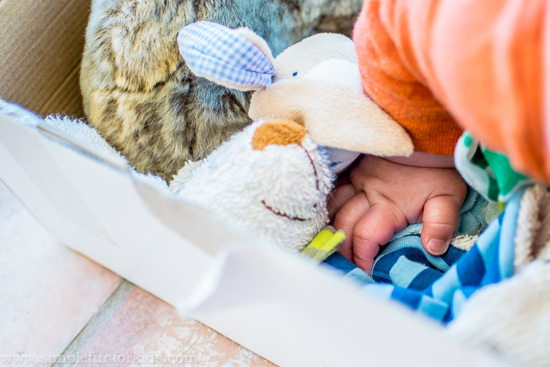 It really doesn’t take that many different items to entertain a baby for a while, so just go with what you have on hand. I sorted the items into the four corners of the box and plopped N down in the middle of it all. 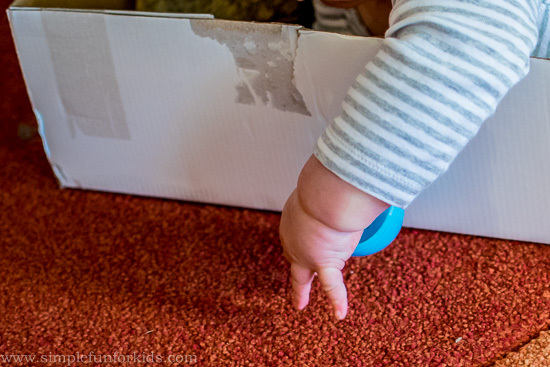 He always enjoys pushing containers around, and he quickly discovered that they made a fun sound on the cardboard. After a while, he turned around to check out the corner with the soft items. 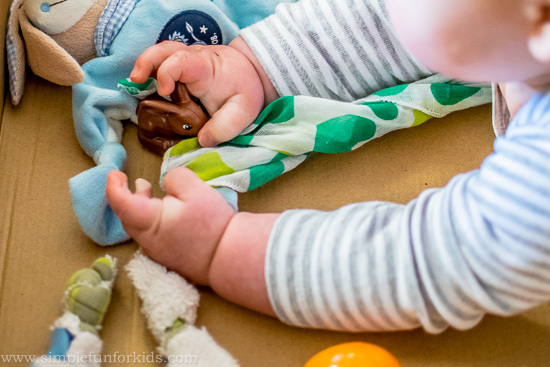 Stuffed bunny ears are great for chewing! 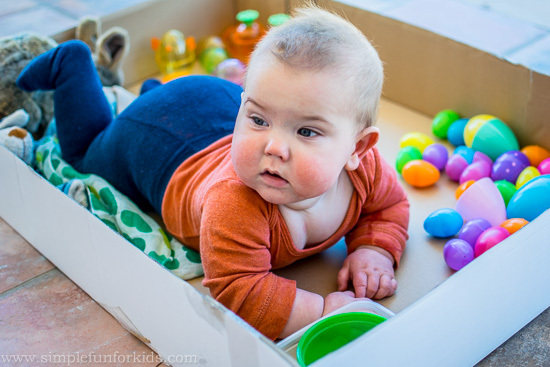 N loved kicking the sides of the box and making the Easter eggs jump. 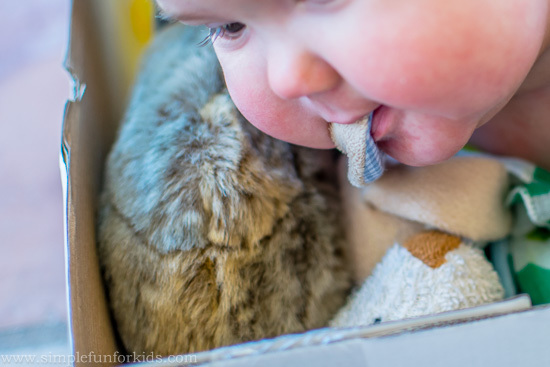 The next time N used his full body sensory bin, he really liked the LEGO bunny. 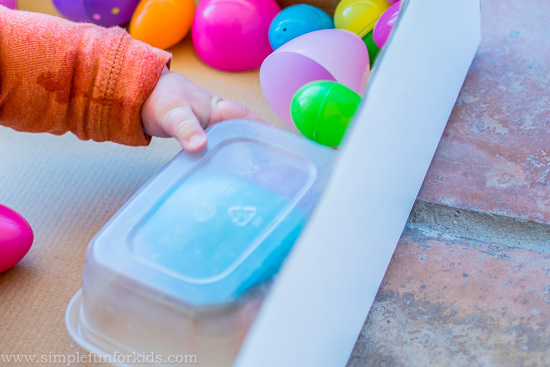 And he experimented with dropping half eggs out of the box and picking them up again. I showed him the shaker E had made for him, and he tried it out for a few seconds but he wasn’t REALLY into it. 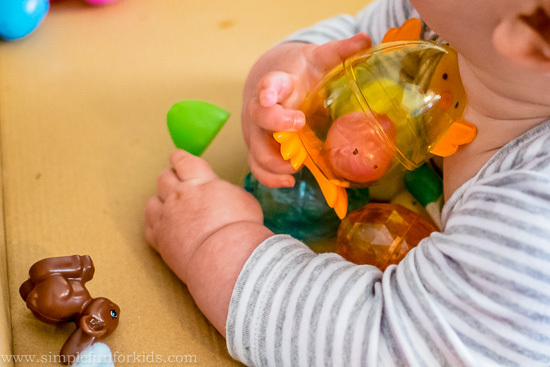 Have you made a sensory bin for a baby? What would you add? Leave a comment below! Love this! 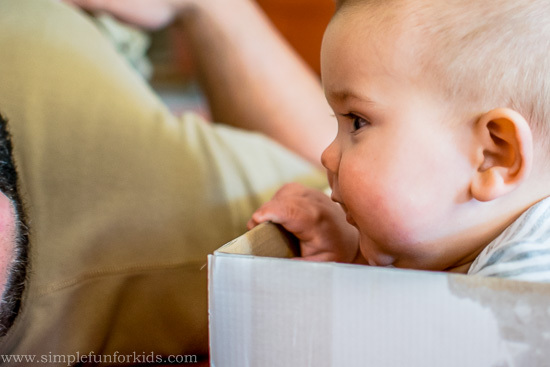 The baby usually misses out on the holiday fun in our house but not anymore!! 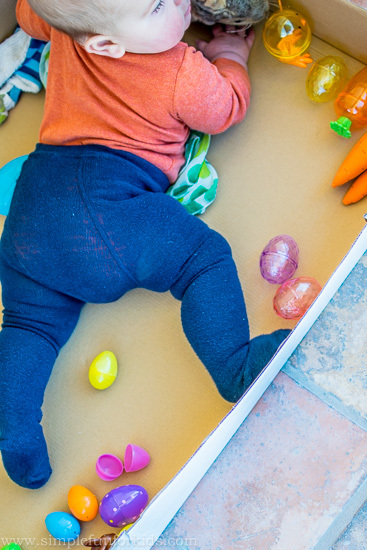 What a great way to share Easter with your baby.Thanks for taking part in the Parenting Pin-It Party.